Along with some insanely ridiculous comments, I have gotten a fair amount of advice, suggestions, feedback from friends, relatives, strangers, and other runners. Let me preface myself before I proceed - this is all meant in fun and humor. I am not offended by those of you who've made any of the below comments, I know they were meant from the heart. This is simply me trying to find a bit of light-heartedness right now, something I've been lacking. 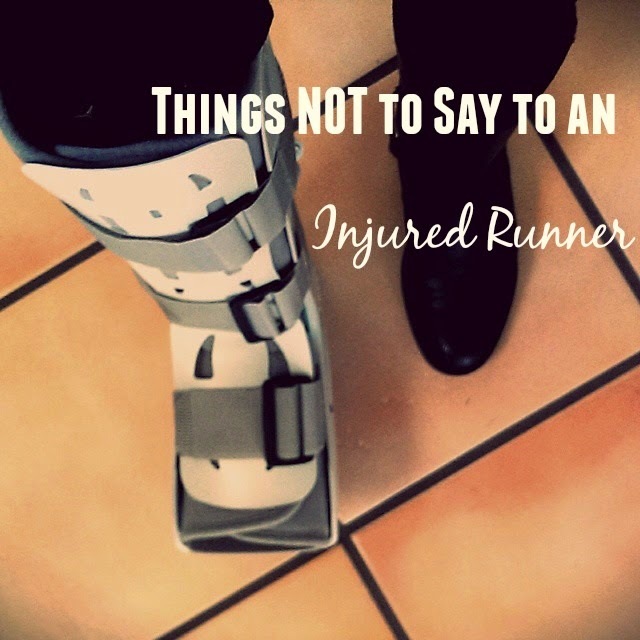 But, since I've been injured, I've come up with a list of things that you should never say to an injured runner. Again, all in fun. Don't brag about your own running miles please. The injured runner is staring at a big fat goose egg for miles week after week knowing they'll never hit the year in miles. Please oh please don't say you "only" got in x number of miles. At a certain point, an injured runner would do just about anything to say they ran a single mile. Please don't proclaim anything remotely close to, "I had an awesome run." I'm glad for you. I am. Just say, "training is going well." Don't suggest a list of alternate activities. Appreciated, but not the same as running. And the list is mentally stashed for desperate times I promise. Avoid complaining about running. An injured runner wouldn't care if it was a blizzard or hurricane as long as they could run. Don't suggest embracing the downtime. The brain doesn't understand why it's not getting it's important zen time, not to be confused with downtime. Yes runners tend to be type A and need to learn to slow down, slow not stop. Saying something like, "Yep, that running will kill ya" may very well get you injured as well. Seriously, that boot could be used as a weapon. What would you add to this list? Or what would you say people SHOULD say?